Our favourite spherical hero is back, only this time in glorious 3D! 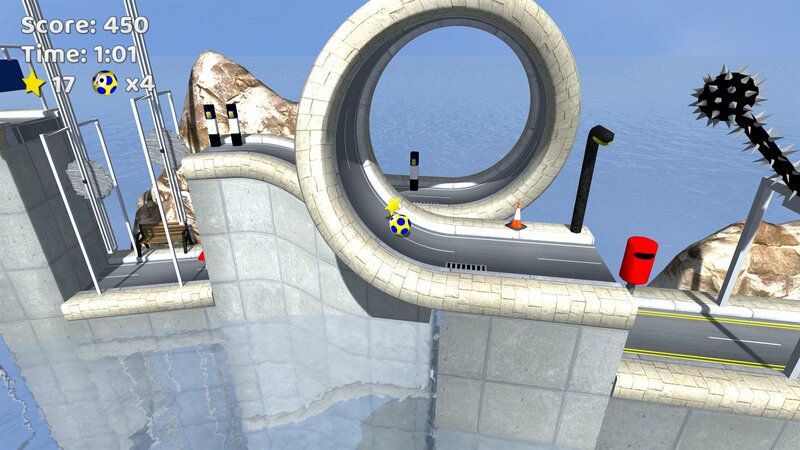 Can you navigate through 24 huge levels across 6 different themes? Be prepared to take on all the platformer classics: spikes, mines, dynamite, conveyor belts, springs, switches, doors, bumpers, lasers, saws, fire, ice, water, electricity and trapdoors, not to mention a host of enemies and bosses! 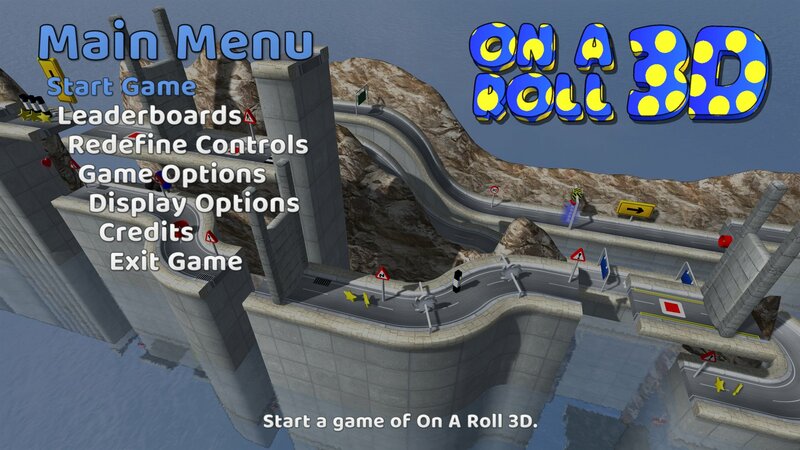 On A Roll 3D was released on 12th February 2015 on Steam for PC, and on 14th October 2016 support for Mac and Linux was added. On 2nd March 2018 it was our first release on iOS when it became available for iPad and iPhone, with full support for Game Center achievements and leaderboards. On 7th December 2018, the game became our first release on Xbox One with support for Xbox Live leaderboards and achievements. The Steam verion has a community area for the game here, which contains a forum (feel free to post - we always reply!) 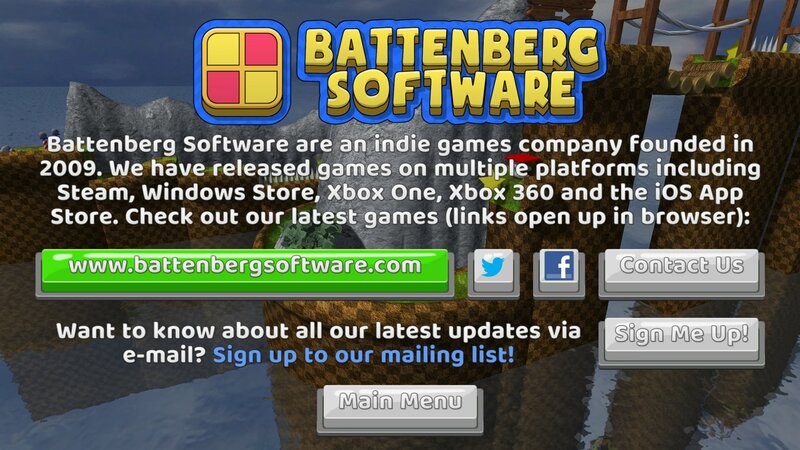 and an area for uploading your own screenshots and artwork. The Steam version has full controller support, and supports Steam achievements and leaderboards. 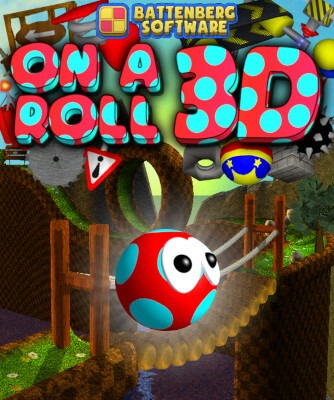 On A Roll 3D is the sequel to On A Roll, which was the first game ever released by Battenberg Software. We've written a level guide below, which gives you a few handy hints and tips on how to get through the game and how to defeat the bosses. Here is a video trailer and some screenshots from the game. Click on the screenshots to view larger versions. You can also download the soundtrack to the game for free here. On A Roll 3D is split into six separate levels, each of which have three areas and a boss. This brief guide explains what you can find on each level, what nasties you'll have to contend with if you're to get through it and the best way to defeat each boss. Enjoy! The first level of the game is an opportunity to learn the basics of On A Roll 3D, with plenty of tutorial hints to help you along the way. 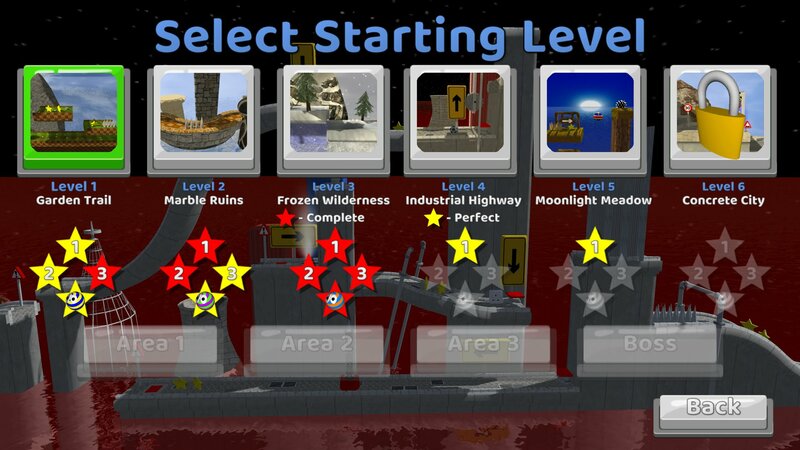 The first area introduces stars, conveyor belts, restart points and spikes, all of which are fairly straightforward. Switches, doors and trapdoors are introduced in the second area, then finally spikes that rise out of the ground, bumpers and pushable blocks in area 3. In terms of enemies, you'll only find the basic "rolling" ones on the first two areas, and the "bouncing" ones in area 3. None of the enemies move particularly quickly, so they're fairly easy to kill. The boss is just a larger version of the rolling enemy, and it takes 10 hits to kill. Beware that like all bosses it will speed up the more hits it takes, but you can usually string together a series of hits by repeatedly bouncing on it. The game gets noticeably more difficult once you begin the second level as you'll have to contend with lasers and circular saws immediately. 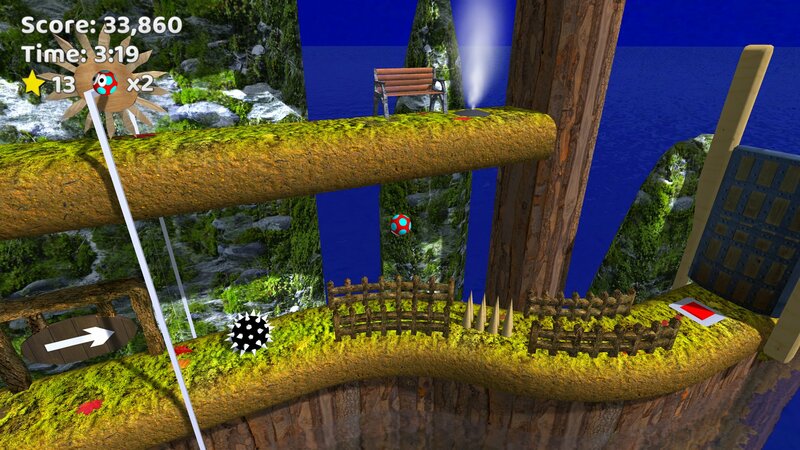 As you progress, levers, mines, swinging spikes and seesaws are also introduced, and the game takes on a much more "3D feel" with platforms often overlapping each other. A third type of enemy, which rolls away from you when you are in the air and towards you when you are on the ground is introduced. 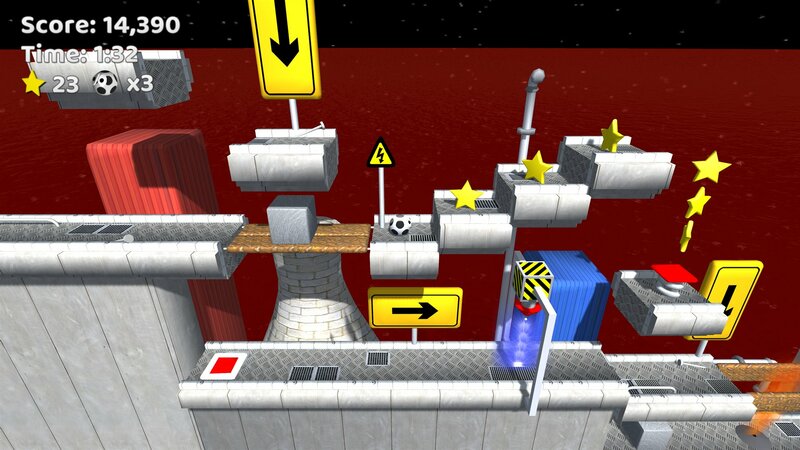 This level isn't too tricky, but there are a much wider range of ways to lose stars and lives and many of the puzzles become harder, so you'll have to be careful. The boss is a large version of the bouncing enemy that was introduced on level 1. This one bounces the entire height of the boss area, so there's nowhere to hide. You can hit it from any angle though, so as long as you ensure you're in the air as much as possible, you should be fine. It takes 15 hits to defeat. 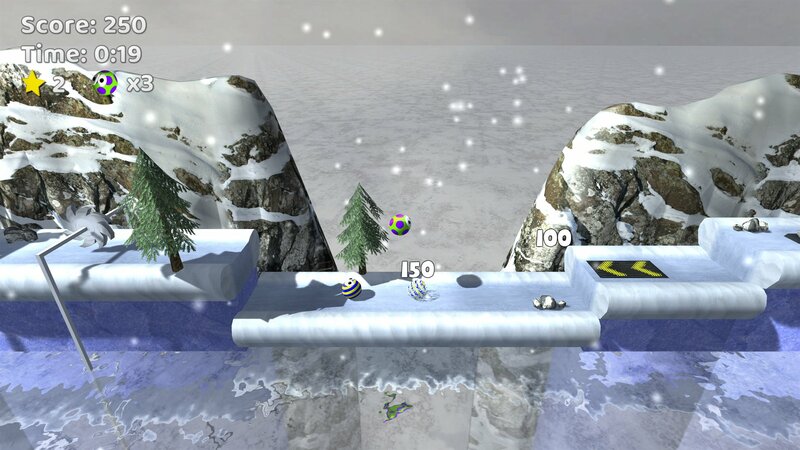 The third level of the game takes you through a snow and ice-themed level. Be careful not to fall into one of the many gaps in the level onto the ice below as doing so will cause you to lose a life. Lots more dangers are introduced here, including fire and steam that come out of the ground (avoid the fire, use the steam to your advantage! 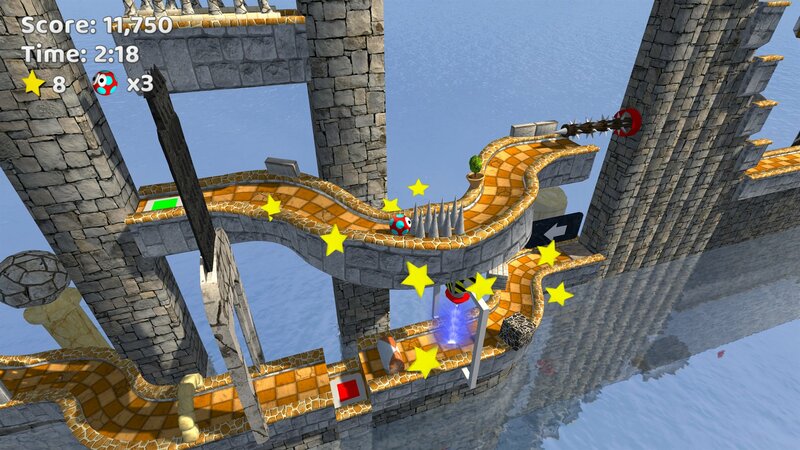 ), blocks with spikes coming out of them and spinning silver stars that you'll have to jump over or roll under to avoid. Two new enemies can also be found on this level - one that moves towards you and then away from you repeatedly, and one that jumps at the same time you jump, which can make it difficult to hit. The boss is a large version of the enemy that jumps when you do, and it takes 20 hits to kill. It jumps higher than you do, so it can be quite difficult to hit, and you'll need to get into a rhythm quickly. Try either jumping when you're very close to it so you hit it before it gets into the air, or jumping twice in quick succession so it doesn't have change to jump a second time when you do. The second half of the game begins with Industrial Highway, where you'll have to deal with electric fences, plates of spikes that rise up out of the ground and fire that can't decide whether it's actually steam! Things get a lot more difficult here, not least because a new enemy is introduced that bounces around the screen with a total disregard for gravity, and because some of the enemies are now covered in spikes. 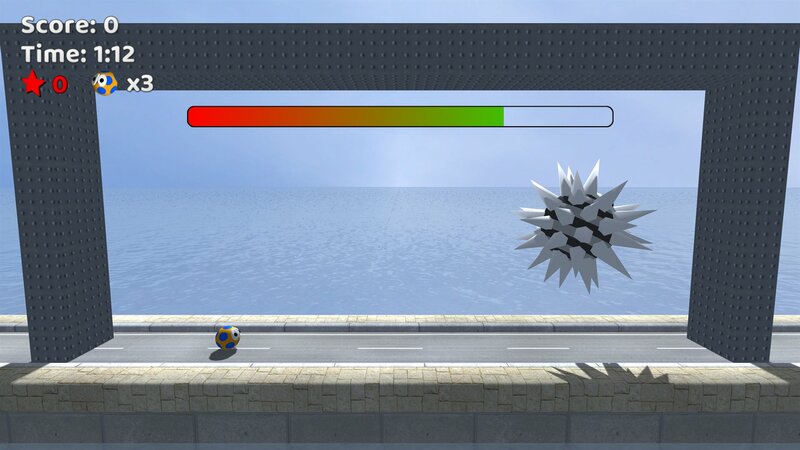 Avoid the spike-covered enemies completely - they cannot be killed. The Industrial Highway boss is one of the enemies that moves towards you then back away from you. This means you are actually safe at the far left or right of the boss area, but you'll have to venture into the middle to hit it, which you have to do 25 times. To make things even more difficult it has spikes that periodically appear, so make sure you don't go near it when they're visible. In fact the spikes are present on all bosses from this point onwards. 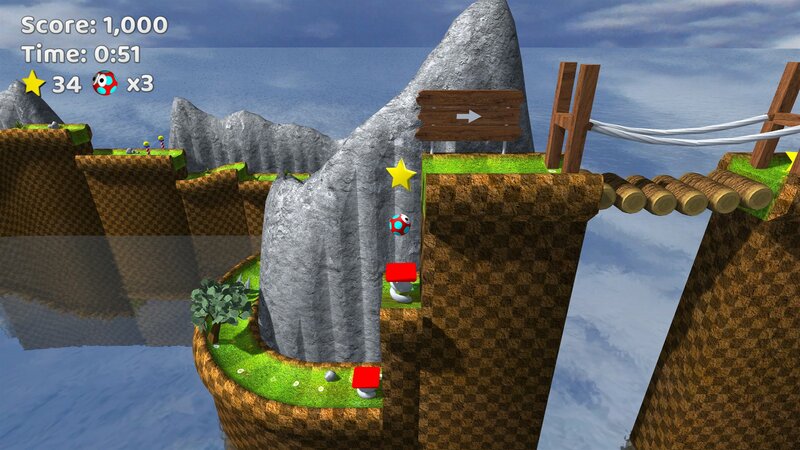 Don't let the tranquil setting of Moonlight Meadow fool you; this not an easy level. The only new things you'll have to contend with are blocks that you must jump across that spin round (try not to fall off, especially as they are often over water) and wooden balls, again situated in the water that you must try not to slide off. There are lots of enemies which now move a lot faster, and many of them have spikes too. So to summarize, keep alert at all times, and enjoy the scenery if you get chance. The boss is one of the enemies that roll towards you when you are on the ground, and away from you when you are in the air. It is once again periodically covered in spikes, so when it is make sure you are jumping as much as possible. Try to pin it against a wall and get in as many hits as possible, but beware that the more hits it takes, the faster it gets. 30 hits will kill it. This is it, the final level. Concrete City will require all of your On A Roll 3D skills to complete as it contains everything you've encountered so far plus a couple of new nasties. Firstly there's dynamite, which will be triggered when you get within a certain distance of it, after which you must make sure you're not within that distance a second later when it explodes. Secondly, on areas 2 and 3, the entire screen turns upside-down for a while. Watch out for everything going a lot faster on this level too (spikes that rise out of the ground, lasers, trapdoors, etc). The final boss is a large version of the enemy that bounces around the screen. It is periodically covered in spikes and it gets very fast as it takes more hits (a massive 35 of which are required to kill it). Staying on the ground is the best policy for avoiding it, so only jump when you're certain you can get a direct hit.